Polycom SoundPoint IP 550 PoE Backlit Display Phone (2201-12550-025) "Grade B"
Home » Phones » Polycom » Polycom SoundPoint IP 550 PoE Backlit Display Phone (2201-12550-025) "Grade B"
The SoundPoint IP 550 is a premium, four-line, SIP desktop phone. It delivers crystal-clear HD voice quality that meets the voice communication needs of even the most discerning users. The phone supports shared call/bridged line appearance, an essential feature for effective phone interaction between busy professionals and their business contacts. This listing is for a Grade B - Refurbished phone. Grade B - Refurbished phones are fully functional but have moderate scratches and/or yellowing that cannot be removed through the refurbishing process. All Polycom Soundpoint IP 550 phones all look and work the same. Release 1 and Release 2 phones are identical. All phones are PoE capabilty and we offer the power adapter as an optional item. 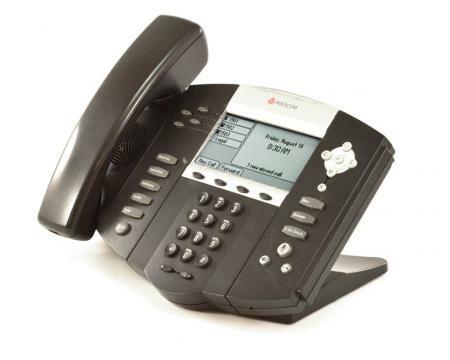 Polycom SoundPoint IP 330 VoIP Phone (2200-12330-001) "Grade B"
Polycom SoundPoint IP 560 Display Phone (2200-12560-001) "Grade B"
Polycom VVX 400 IP Phone (2200-46157-025) "Grade B"